The ZIPANG vision inspires the ZIPANG mission. ZIPANG is the Sumerian word for 'breath'. • brings together Iraqi and non-Iraqi scholars, storytellers, musicians and enthusiasts to develop their shared appreciation of Mesopotamian literature, and spread this appreciation to as many people as possible. The ZIPANG storytellers depend for their performance material on the work of academic translators and teachers. Visit the Enheduanna Society’s Online Art Gallery to view exhibitions of contemporary art inspired by ancient Mesopotamian art and mythology. Click here to find out how you can support the work of the Enheduanna Society. The Enheduanna Society launched its Zipang Recording Project in late 2017. The purpose of the project is to record the Zipang repertoire of re-told Mesopotamian stories. This repertoire is based closely on academic translations of the original Sumerian and Akkadian texts. It has been developed by the Zipang storytellers through twenty years of public performances. The Zipang Recording Project enables stories, recorded in both English and Arabic, to be listened to online or downloaded, providing a free and easily accessible introduction to the literature of ancient Iraq. Click on the ZRP button above for currently available stories. More stories will be added in the months ahead. To enable more stories to be recorded and put online, you can Sponsor-a-Story. A lamassu has come to Trafalgar Square! 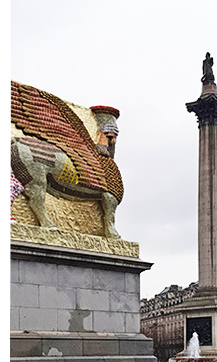 A life-size lamassu made from empty date syrup cans by the renowned Iraqi-American artist, Michael Rakowitz, will stand on the Fourth Plinth in Trafalgar Square for two years. The sculpture is called The Invisible Enemy Should Not Exist. It was unveiled on Wednesday 28th March 2018. Date syrup was a significant item in the Mesopotamian myth of Lugalbanda. As a first in the Arab world and the Middle East, the Iraqi Business Council (IBC) included in its Jordan Cultural Program an evening with Mesopotamian storytelling. It took place on 15th February 2018 at the Amman Royal Hotel. June Peters and Badia Obaid told three Mesopotamian stories, and Simon Clemenson gave a presentation on cuneiform writing. Gilgamesh 21 went live in November 2016. This 21st-century multimedia and bilingual retelling by young people of the ancient Gilgamesh epic showcases artwork, performances, animations, poetry and written retellings by participants in the Gilgamesh epic project. Click here to view a 9-minute documentary about the Gilgamesh epic project for young people. and projects from several organisations.